Happy 2017 you guys! Yes, yes, I know I am VERY late to the game in well wishing. I wanted to share wth you a big update in my life that I haven't officially gone public with here. As some of you know, at the end of each year, I spend time reflecting on the previous months, and spend time praying and contemplating what my word for the following year will be. This has been my tradition since I started working for myself 6 years ago - to remind me throughout the year, what to focus my heart on. If you've been around my blog for any length of time, you know that each year I choose a word for the year for me to focus on. This word helps center me, encourage me throughout the year and gives me an overarching goal to focus my business decisions towards. 2015's word was "Expand" and 2014's word was "Courage". I wanted to go ahead and share a little bit about what a crazy few weeks it's been! If you follow me on social media, you are aware of what I've been dealing with. I started out working with a web developer to design a new site in Wordpress and about 2 days in, my website got hacked. Today I'm excited to share with you that the fabulous Monica Lee of Smart Creative Women interviewed me about my artistic journey, advice for artists, the licensing industry, and more! Great way to start your morning with a good podcast listening to girl chat, with your cup of coffee or tea! Head on over to Smart Creative Women for a listen & we would love your feedback and comments under the post! Also, coming up next Wednesday, July 15th at 5:30pm (PST), Melissa & John, the powerhouse duo of Ideaologie will be interviewing me with the questions you submit! We would love your questions about art licensing, and need them by this Friday. I invite you to head on over to Tara Reed's website to submit your questions. You can also listen in to our interview LIVE that day, or listen to the audio afterwards. Find out more here. In case you haven't heard, Tara Reed is moving on to some exciting new things and recently sold the teaching side of her business to Ideaologie. You can catch up on the news here: Tara Reed's ArtLicensingBlog & the fun Ideaologie Video. I'm very excited for both Tara & Ideaologie and can't wait to see what's next for them! Here we are, at the end of January 2015 and I'm finally getting around to sharing my word for the year with you! But I wanted to share it nonetheless. My word for 2015 is "Expand". When I reflect on this word, it's purpose for me is to expand outside of my comfort zone. To expand and push myself creatively & to not be held back by fear and the unknown. To take a leap...multiple leaps into directions that bring joy and excitement. I started doing this towards the end of 2014. Taking creative leaps. I was so afraid to do it, even though it was beckoning my heart for many months. I think it's human nature to get into a comfort zone. To live a predictable life. A safe one. To keep living each day in a way you know you can manage it & contain it. There usually are cycles in our lives where we desire to break out of our routine. To change things up. A daring haircut. A new color scheme for your home. Wallpaper. To heart matters like standing up to, and for, those you need to. Saying "no" without being sorry about it, and saying "yes" to things your heart truly wants but you're so scared to walk towards. One of my absolute favorite movies is "The Secret Life of Walter Mitty". It truly spoke to me on so many levels, one of which I want to share with you today. Have you seen it? So, after some pretty huge steps (getting into a plane with a drunk pilot, jumping out of the plane into the open waters & getting into a shark fight, reclaiming his old love by skateboarding down a windy mountain...you know...easy stuff), there's this scene where Walter ends up in Iceland and is finally hot on Sean's trail...at the time of a volcano eruption. Walter looks up and sees Sean standing on top of a biplane heading towards the erupting volcano. And I thought - wow, each of us have our own boxes we put ourselves in, don't we? Some of us larger ones than others...out of choice. Here Sean is, going into an erupting volcano, and there's Walter standing with both feet planted on the ground, who had a hard time even thinking of leaving the country. If you haven't seen it, the movie is really inspiring as it captures this small but powerful portion of his life, through how he decides to take steps each day out of his comfort zone, all the while experiencing a much richer and more adventurous life. He ends up a much truer version of himself. So my question is - what is your box? What are the limits you've put on yourself for whatever reason? And since we control our own lives, why are we choosing to live small? How can we allow more growth and make our heart and soul that much bigger to fit more in it? Many times we have a "why". Why we allow ourselves to stay small, not take the leap and stay where we are most comfortable. But to be honest, those "why's" are just handcuffs we choose put on ourselves. Excuses to keep us from our bigger fear of failure. That, my friends, is something we need to face head on. To not hide from, dodge, or make excuses for. We need to dig down deep, figure out what is important to us - not what everyone else is doing - and go for it! Could you imagine what this world would look like if we all lived like this? Even just 25% more? So, with my word "Expand" for 2015, I encourage all of us to figure out what's important to us alone, and chart out the baby steps we need to take to be actively moving in that direction. Some days will be baby steps and some days will be big leaps, but the important thing is that we are moving forward. 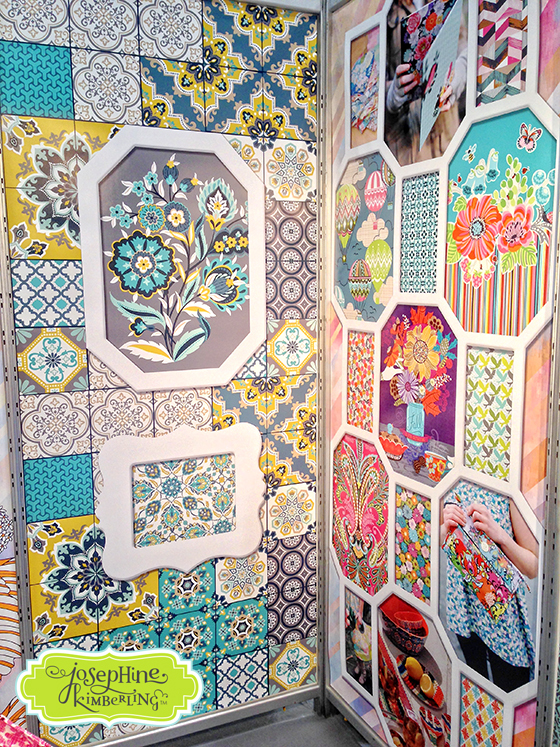 Surtex 2014 has come to an end and can I just tell you what a whirlwind this year was? Oh my goodness!! Usually the busyness goes in this order: Monday, Sunday, with Tuesday being pretty dead. This year? Monday, Tuesday, with Sunday being the slowest day of the show. The floor seemed pretty sparse and there wasn't a lot of hustling and bustling down the isles like Surtex 2011 & 2012. However, the quality of attendees and the interest level and seriousness was definitely up! There were a lot of new exhibitors this year and I must say, the booths looked really professional. You could tell that artists did their homework and really thought about how to present their work. Even the artists walking the show handled themselves really well. I think all of the online sharing, licensing coaching and classes are really helping educate artists and elevate this industry. Such a plus! 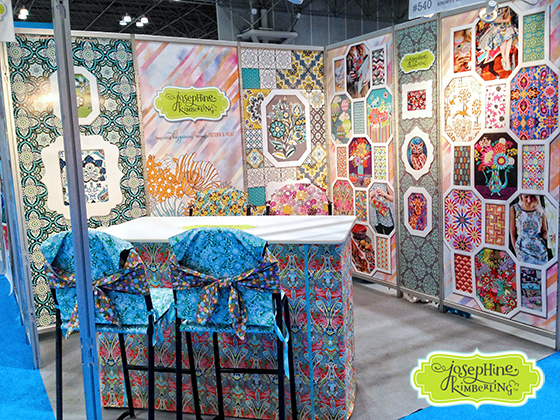 This was my 4th year exhibiting at Surtex and I think this was seriously my best year yet. For me, 3 years was not a charm, but 4 just might be. We'll see. For all of us in this business, you know that how the show goes, doesn't always determine how successful it will be in the end. I met some great contacts with big potential opportunities, and will just need to be persistent and see what comes through. Either way, it's good relationship building and wonderful to get on their radar! My fingers are crossed for myself and all of the other exhibitors. May each of us match up with great Licensee's and opportunities to get more art into the world and make products just that much prettier! This year in addition to having my own booth, my art was also being showcased at my agent's booth, MHS Licensing, just down the isle. Many artists stopped by to ask why I was exhibiting since my agent was exhibiting for me, so I thought I'd share that with you. First off, I signed up for Surtex way back in August of 2013, and I couldn't get out of exhibiting at the show unless I wanted to lose the entire cost of my booth (it's in the contract). Yikes! And I just couldn't stomach that. Also, I just decided I wanted an agent and signed with one about 2 months ago. But I must say that having my own booth there as well as my work being shown at my agent's booth was pretty much magic. I really enjoyed showcasing my artistic style and vision completely in my booth and I think it really helped Licensee's to see it all put together. Also, having worked in product development, I really enjoy the interaction with Licensee's and learning about their business directly. I enjoy hearing what works and what doesn't. What colors sell well and what their printing limitations are, as these things help make me a better designer. Another question I was asked was if I would exhibit again next year. To be honest, I just don't know at this point. I mostly think I'll take a year off, but I'm not making any promises. We'll see! So, last year I did the show by myself, and I thought I'd just do it myself again this year, but 1 week before Surtex, I decided to reach out to a dear friend of mine to see if she would, by chance, be up for helping me out in my booth. Strangely enough, her schedule was completely clear for those days and everything worked out great for her to come along. I seriously couldn't have made it through this year without her! TIP #1: Bring a friend to help you in your booth! Seriously. Sure, you'll need to run to the bathroom, and your neighbors can watch your booth. Sure, you can bring snacks to eat at your booth. But, it's great to have that extra hand there to take notes for you when you're engaged in a conversation with a Licensee. It's helpful to have someone there to reach out to companies hovering behind Licensee's who are currently sitting at your booth. And, sometimes I think it's just a bit easier for people to approach you, in general, when there's someone there with you that you're casually chatting with. It's like the ice is already kind of broken at that point. Regarding booth display, in previous years I've added some sort of 3D element - year 1 was paper pinwheels made out of my patterns. Year 2 was a collage of my art and photos of my licensed products on foam core for a dimensional display. Year 3 I shipped small tables and brought lots of my licensed products to display as well as hung large ornate frames on my walls and put in white flooring. And although it was lovely, I vowed to never ship that much to the show ever again. Never ever. This year, year 4, I decided to skip all the madness and just focus on good, solid art printed on banners with a "World of Josephine Kimberling" focus, showcasing my artistic breadth. TIP #2: Find a great company who can reproduce your art and colors really well for your booth walls. I use UPrinting and have for the past 2 years. They're awesome and I HIGHLY recommend them! TIP #3: It's about your art AND how you present it. Don't just think about you - think about them. Think about what types of products you think your art would work best for, then showcase those designs. 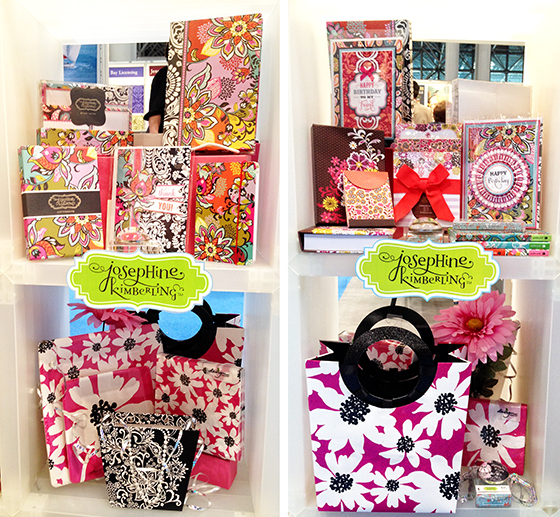 Regarding your display, figure out the right match for you and what works with your artistic and graphic design style. Just be careful to not have an amazing display with not so strong art or really strong art that's laid out in a way that makes it hard to see and that isn't captivating. Be original and unique, and display your work in a way that allows your strongest assets to stand out. Having my friend Karin there to help allowed me to take time to say hello and visit with the artists who stopped by. And I must say that I am truly humbled by each and every one of you who stopped by and had such kind things to say. I seriously didn't even realize that I was inspiring anyone. I'm human just like you and have most likely gone through the same things you are going through now. I can't thank each of you enough for your kind words. The one that takes the cake is a girl who told me that I was one of the people who inspired her to quit her job and go out on her own. Yeah girl!! We're all on this journey on different paths, together. Working to make the world a more beautiful place with our art. So, that wraps up Surtex 2104! I'll be exhibiting next month at the Licensing Expo in Las Vegas for my first time in booth #E-18 (again, signed up for it before I signed with an agent! ), and will keep you posted on that show as well. If you're a Licensee, please stop by and say hello! I have BIG NEWS to share with you today! I recently signed with MHS Licensing + Consulting agency! I'm very excited about my decision to work with an agent, and am really enjoying working with MHS. They have a great reputation in the industry and I'm thrilled to see what both of our strengths combined, can build together. They will be handling the logistical side of my licensing business, to free me up to create more art! Today I wanted to share the journey of my discovery that I was ready for a licensing agent and how I went about finding one, in hopes that it may help another artist out there who may be at a similar cross in the road. Signing with an agent is one of the big questions almost all artists end up asking themselves and some point in their career. When I left the corporate world in 2011, I had decided that I wanted to learn the ropes of the licensing industry myself and navigate the waters on my own. I had already been approached by 2 agencies at that point and have been wrestling with this decision throughout the years. With 12 years of corporate experience, including managing, giving trend presentations to high-level positions, and being responsible for streamlining and developing processes for print design throughout a company, I knew I was both a right and left brained artist and found joy in both the business and creative sides of the industry. So, being the fierce independent that I am, I wanted to give it a try on my own. Since I started my business in 2011, I am very humbled by and blessed that it has kept growing and growing. As I reflected at the beginning of this year on 2013 I knew I needed to make some tough decisions about my business, as it was getting too much for me to handle on my own. As I mentioned in my Word for 2014 blog post, I didn't take a vacation at all last year. Things were bottle-necking. Simple things started to fall off my radar, and being the over-responsible person that I am, that really freaked me out. I just couldn't do it all successfully, and something needed to give. I'd rather make the decision on what that was than to have things fall apart and be out of my hands. A series of things converged at the beginning of this year that led me to my decision to search for an agent. 1) With my business growing, I was getting less and less time to create original artwork. Most of my time was being spent answering e-mails, reviewing contracts with my lawyer, business planning, and a lot of the back and forth that happens when running a business and trying to navigate the licensing waters and land deals. I wasn't approaching companies I wanted to work with anymore. I was just managing the inquiries that were coming in. Which again, huge blessing! But it's a double edged sword - in order to keep your business growing, you need to not only secure licensing deals, but you also need to create new artwork to keep your Licensee's happy and secure more business. And I LOVE creating and just wasn't getting enough time to do it. 2) I read the book The E-Myth Revisited which completely explained my business and where it was heading if I didn't take control and get more hands on deck. A direction that I surely didn't want to go. Everything this book talked about made sense to me, as I had seen it when I worked corporately - why some divisions succeeded, and some didn't, and there was no way I was going to let those things stand in my way. I spent countless hours on business coaching, etc. with E-myth, which was awesome, but again, filling my plate with more and more non-creative work. And to be honest, there's tons of information out there for newbie artists and not a lot of information out there for those of us who are at the mid-level of our business building, so E-myth was great. 3) For those of you who know me, I'm a huge supporter of personality-type tests. I am a big advocate of the Strengthsfinder, and this year they came out with the Entrepreneurial Strengthsfinder test, so I took it. And although my main strength out of the 10, is "Independance" (which they say means that people who have this talent can single-handedly start & operate a business successfully-yay! ), it also showed me that the area I am least strong in, is being a "Promoter" and that because of my soft approach, I should team-up with people who can champion my business. That information alone really woke me up and helped me pinpoint what type of help my business could use for it's next stage. 4) I had spoken to my lawyer about, and reviewed information on hiring employee's, interns, independent contractors, etc. After a series of conversations with my lawyer and hoop jumping, I realized that this option just wasn't the right fit for me and my business right now. Yes, I actually would like to hire employee's in the future, but the timing is just not quite right. I also knew that the things that I wanted to hire employees for, right now, would help me maintain what I have going, but not grow me to where I want to be. After all this research, soul searching and exploring different avenue's I knew it was time for me to get an agent. When I came to this conclusion and asked my husband his thoughts, he said "Yes, of course! You've been thinking about it forever and you need help, so why not?". Hmmm...maybe I should have started with asking him! ha ha! But I knew that I needed to really come to that conclusion myself. His answer did seal the deal for me though. So I started researching licensing agencies, asking Licensee's who they like working with and who they would recommend for me, asking artists who have agents what they think of working with them, re-approaching agents who had approached me in the past, etc. I knew I needed to work with an agency who I felt I could trust, who had streamlined processes in place (because yes, I admit, I AM a type A artist), who could articulate what they could do for me and specify what signing with them would take off my plate, and to be honest, who were awesome at selling themselves. Because if they could sell themselves to me, then I figured that that would show me their strength and they could help sell my work. I also wanted to make sure that they didn't have an artist already who's artwork was similar to mine...and also who had artist's whom I'd heard of, since that's the type of business I'm trying to grow. After further research (can you tell that research is one of my strengths?...take the Strengthsfinder test!! ), and narrowing down my list of agencies to 3, MHS seriously met all my criteria. I'm very excited to work with them and to get some things off my plate so I can do what I love to do most, which is create more and more art! So, this was my crazy process in discovering what next steps my business needed as well as in finding an agent. If you're an artist in this same boat, I hope this helps you discover what you need for your next steps, whatever they may be!